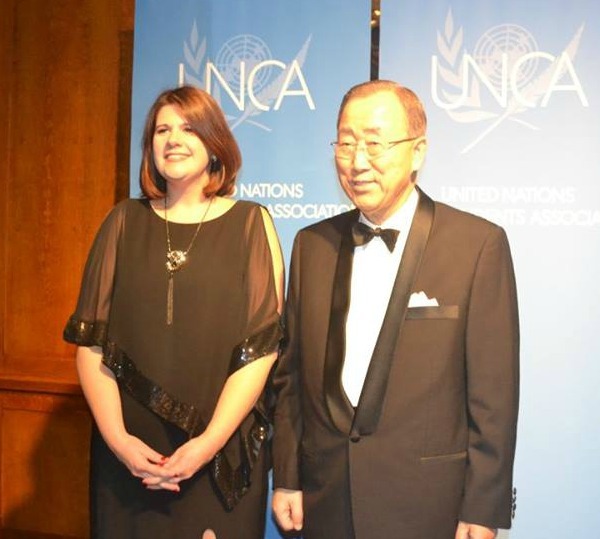 VIDEO & PHOTOS: World Moms Blog at the 2015 @UNCANews Awards! 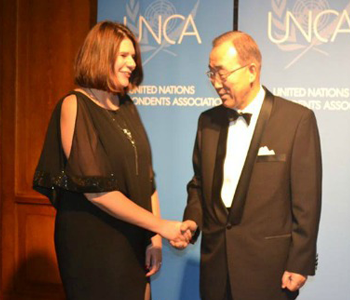 Today on the blog we are sharing a video and photos from our time at the UN Correspondents Association (UNCA) gala from December 14th, 2015 on the blog! World Mom, Purnima Ramakrishnan of India, won the Elizabeth Neuffer Bronze award for “Best Reporting on the UN.” She was unable to attend due to family obligations and the floods in Chennai, India, where she resides. In her place, Elizabeth Atalay, our Managing Editor, and I had the honor of accepting Purnima’s award for her at the UNCA gala. It was an incredible night! Prior to the awards, I was invited to a private cocktail hour with fellow award winners, where we had the honor of meeting UN Secretary General, Ban ki-Moon! After shaking hands, we had the opportunity for a mini photo session with the UN Secretary General. Elizabeth and I met up with Dan Thomas, Communications Director and Spokesperson for the President of the UN. We worked with Dan when he was in Switzerland at the GAVI Alliance on a project to help raise awareness for vaccinations in the developing world. It was so fun to finally all meet in person! Meeting and talking with fellow UNCA award winners was also a highlight of the night! 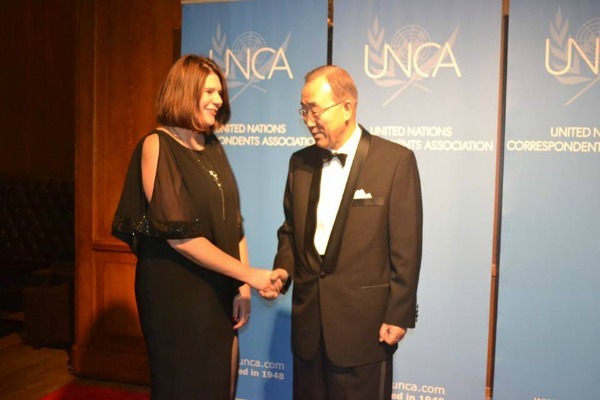 Please see the full list of the 2015 UNCA award winners at the UNCA.com site. We are thankful to our community of readers, contributors and editors. Look what we can achieve with you all! Thank you for believing in us. We, at World Moms Blog, are looking forward to 2016 and have a lot of exciting plans to announce in the year ahead! Video credit to UNCA. 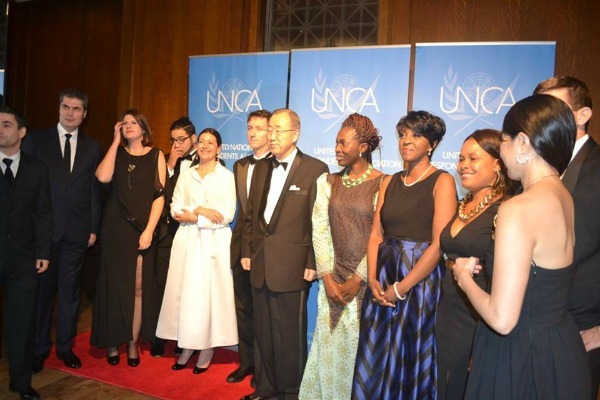 Photo credit of Jennifer Burden and Ban Ki Moon and the UNCA Award Winners to Jennifer Ehidiamen, whom we met at the UNCA awards. 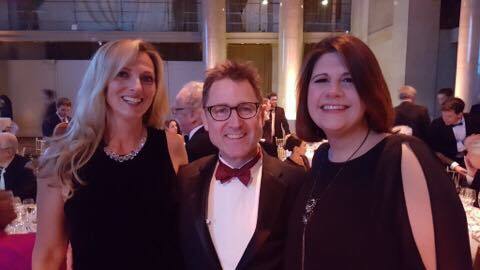 Photo credit of Elizabeth, Dan and Jennifer to the author. Jennifer Burden is the Founder and CEO of World Moms Network, an award winning website on global motherhood, culture, human rights and social good. 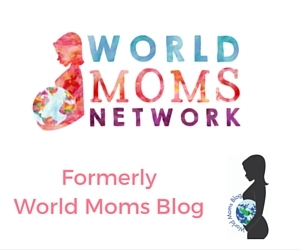 World Moms Network currently writes from over 30 countries, has over 70 contributors, is a volunteer effort and was listed by Forbes Woman as one of the "Best 100 Websites for Women 2012 and 2013." Also in 2013, World Moms Blog was called a "must read" by The New York Times Motherlode, and was recommended by The Times of India. Jennifer is the stay-at-home mother to two young girls and an advocate for ONE Girls and Women. She was also a member of a delegation to Uganda to view UNICEF's family health programs with Shot@Life in 2012 and a UN Foundation "Global Influencer Fellow" in 2013. In 2014 she was a UN Foundation "Social Media Fellow", attended the Americares Airlift to Nicaragua on behalf of Cognizant, participated in the first AYA Summit and was invited by the World Bank to Washington, DC to report on their global Civil Society Meetings. Jennifer also co-created the #Moms4MDGs twitter campaign that extended from July 2013 to March 2014 to raise awareness on all 8 of the UN's Millennium Development Goals to help eradicate extreme poverty. Her writing has been featured by Baby Center, Huffington Post, ONE.org, the UN Foundation's Shot@Life and The Gates Foundation's "Impatient Optimists." Jennifer can be found on Twitter @JenniferBurden. Thank you, Deborah! It was a great surprise and we are still reeling from the excitement! And, I bought my dress at Marshall’s (a discount place)! It was a lucky find! What a great end to 2015 AND start to the new year. So glad I connected with WMB all those years ago. You looked marvelous.